North Charleston, South Carolina – For the first time in over one hundred and fifty years, you can actually see the Hunley. Until recently, the submarine was completely covered by concretion, an encrusted layer of sand, sediment and shells that built up slowly over time. The concretion masked the original surface of the legendary vessel, hiding many of her finer features. For the past four months, Clemson University conservators have been conducting the delicate task of chiseling away this encrustation. Nearly 70% of the submarine’s exterior has been revealed and they hope to complete the outside of the submarine in the coming weeks. The last areas remaining are being called “forensic hot spots,” indicating areas where they think there may be evidence that could help scientists understand why the Hunley vanished after becoming the world’s first successful combat submarine. – In one area of the hull, the metal surface is stamped with the letters “ C N “. The meaning on this stamp is being investigated, but it is thought to represent the foundry where the Hunley’s iron was forged. – We are learning more about how the weapon system worked. The Hunley’s designers were always looking for ways to improve upon the submarine and it’s method of attack. Because of this process of evolution, it has been unclear how the small Confederate Hunley was able to deliver and detonate the torpedo that brought down one of the Union’s largest and mightiest ships. – There are areas below the dive planes where it looks like the metal surface of the submarine had somehow been pushed in, causing it to be dented. At this point, there is no telling what could have caused these areas of deformation on the hull. One possible scenario is they were inflicted by 19th century recovery efforts. In 1863, the Hunley sank twice during test missions. Each time, divers used ropes and chains to bring her back to land for repair. The last areas left to complete on the outside of the submarine are mainly the sections made of cast iron, specifically sections of the bow and conning towers. As these sensitive areas of “forensic hotspots” are uncovered, the team is hopeful to find evidence that will teach us more about the mysterious events surrounding the Hunley’s final voyage and disappearance. On the evening of February 17, 1864, the H. L. Hunley became the world’s first successful combat submarine by sinking the USS Housatonic. After signaling to shore that the mission had been accomplished, the submarine and her crew of eight mysteriously vanished. Lost at sea for over a century, the Hunley was located in 1995 by Clive Cussler’s National Underwater and Marine Agency (NUMA). The innovative hand-cranked vessel was raised in 2000 and delivered to the Warren Lasch Conservation Center, where an international team of scientists are at work to conserve the submarine for future generations and piece together clues to solve the mystery of her disappearance. 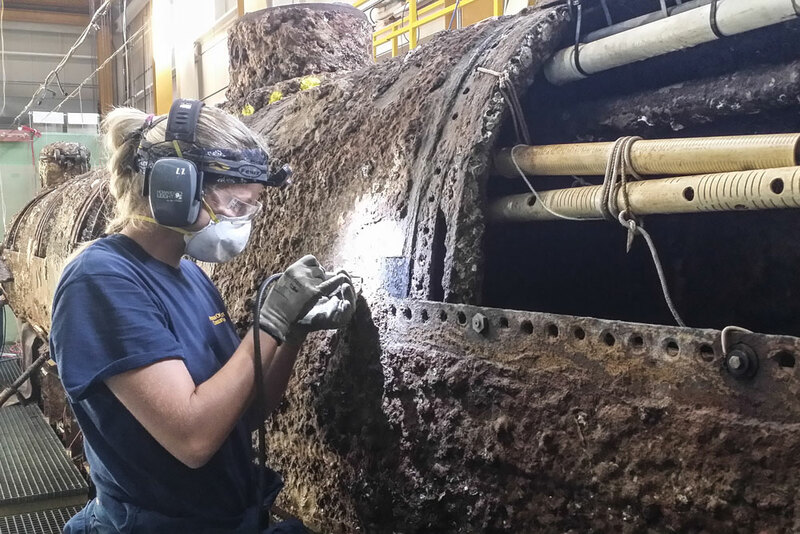 The Hunley Project is conducted through a partnership with the Clemson University Restoration Institute, South Carolina Hunley Commission, Naval History and Heritage Command, and Friends of the Hunley.